P-51D "Petie" Mustang, full moving parts, open/close canopy, excellent paint scheme and splendid performance. Perhaps no aircraft in history was as loved and as effective as the P-51 Mustang. It went from an early British request to one of the greatest American fighters ever to take flight. 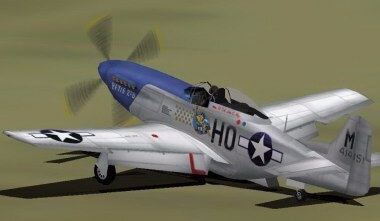 All aircraft of World War Two have been compared to the P-51 for their quality. This particular download is offered in accordance with the terms presented by the author. The aircraft is copyrighted and used in strict compliance with the author's wishes.